Code 46 - Blu-ray Review - ReDVDit! Code 46, on paper, is a fascinating movie. Set in the near future, it follows an insurance fraud investigator, who’s sent to Shanghai to investigate a series of illegal immigration papers that have been traced back to a specific printer. Using a series of genetic viruses to help him in his cause, he quickly tracks down the perpetrator of the papers, a beautiful woman, only to fall in love with her. He finds that they are genetically incompatible, and therefore doomed as a couple. He becomes obsessed with her, abusing his powers as an investigator to find her and track her down in order to overcome the forces working against them. Memories are erased, viruses are abused left and right, and ultimately, his life unravels around him, ending in disaster. Unfortunately, Code 46 becomes quickly bogged down with tons of technical jargon, and several loose ends that are never fully realized. What could have been an incredible example of neo-noir filmmaking becomes victim to one of the worst attempts at world building I have ever seen. Ideas are tossed around, like there being a huge distinction inside the cities and outside of them, but there never seems to be any proof of there being a contrast between the two. Ideas such as genetic manipulation and using viruses to enhance natural capabilities, and yet there only seems to be one flavor of virus with limited application, and it only gets tossed around in an impressive manner once or twice. The film is heavily based around this idea that those who are 25% genetic matches or more cannot mate, and yet it never offers a justification for this, or explains the ramifications of violating such a rule. 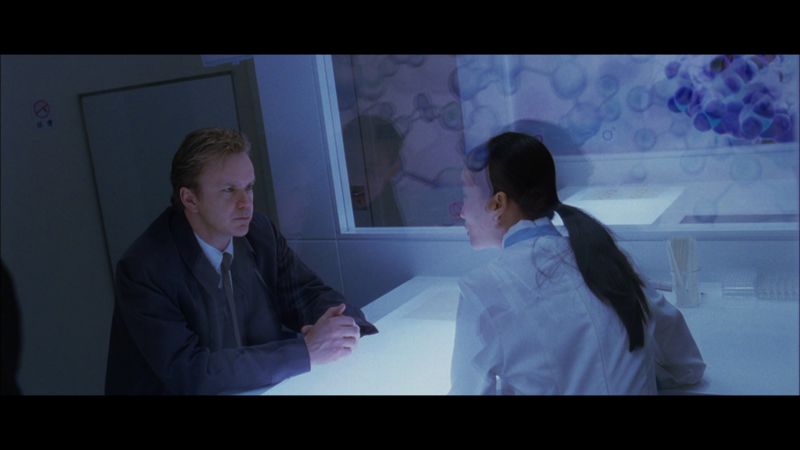 In a pivotal scene, a character is revealed to be a clone of someone’s parent, and instead of following that plot thread, the film just moves on, as if it isn’t important. There’s a really interesting world to be explored here, but the film comes in at a brisk 93 minutes, not nearly enough time to explain itself in a way that invests you into the story. What drags Code 46 down even further, beyond an unconvincing attempt at world building, is our pair of lead actors. Tim Robbins just looks tired and unenthusiastic on screen. It’d be different if his character was cold and distant, but he’s supposed to be convincing us that he’s fallen in love with our lead actress, Samantha Morton. She two just kind of seems lifeless on screen. The lack of energy just ends with a sloppy pile of bad chemistry, which offsets the picture even further. There were bits and pieces of Code 46 that I did enjoy. The film’s cinematography, created by Alwin Kuchler and Marcel Zyskind is cool and dark, perfectly encapsulating the modern noir look. The film is for the most part, heavily underexposed, giving it a grainy, inky texture. 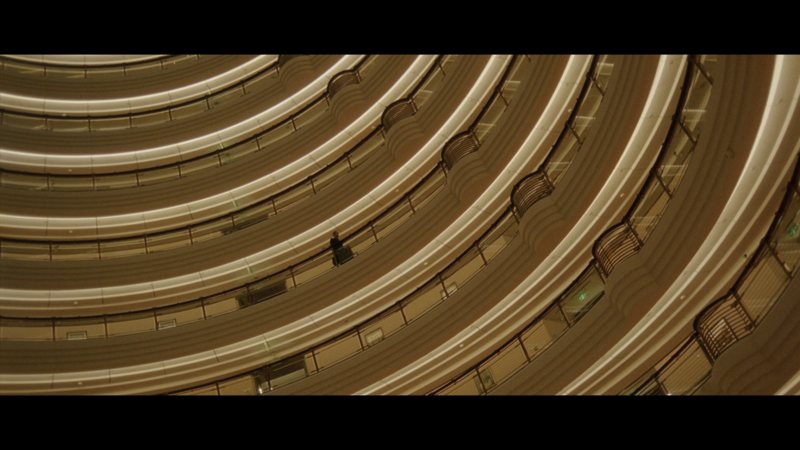 Colors are heavily contrasted, full of dark shadows and bright interior locations; production design seems adequate to the setting, leaning heavily towards sharp, geometric structures, and sparse living quarters to emphasize the minimalist trends of the future. It’s unclear just what Code 46 is trying to do. The film is only 93 minutes long, and yet the acting on screen, and the pace of the editing just makes it feel agonizingly slow, accomplishing very little in it’s short run time. I have a hard time faulting our director, Michael Winterbottom, who directed critically acclaimed films both before and after Code 46, such as 1999’s Wonderland, and the BBC comedy series The Trip. Code 46 reeks of studio intervention, and the result is a terribly underwhelming film that could have been so much more. According to IMDB, Code 46 was shot of 3-perf Super 35mm film negative, and prepared for theatrical distribution using a digital intermediate. The 3-perf production method results in a native aspect ratio of 1.78:1, which means at some point, Code 46‘s negative was cropped in post to achieve the 2.35:1 aspect ratio. The Blu-ray, prepared by Olive Films, retains that 2.35:1 aspect ratio, presenting it in 1080p. I have a hard time believing that Code 46 was prepared using a digital intermediate, given its age, and the amount of little specks of dirt and scratches that are peppered through the film’s video transfer. At one point, a large white mark appears over the left side of the scope frame. Film’s that are prepared in post using a digital intermediate are usually thoroughly cleaned, leading me to believe that this digital master was prepared from a later element, such as an interpositive. Damage aside, Code 46 generally looks very good. The 35mm grain is present in even amounts over the film’s run time, and the image is generally very sharp and detailed. There is an appropriate amount of depth to the image due to the use of spherical lenses, and color, while never vibrant or particularly amazing, is healthy. Code 46‘s 1080p presentation isn’t perfect, but it generally looks very good. Olive Film’s release of Code 46 features a DTS-Master Audio 2.0 stereo soundtrack. Code 46 was originally shown in theaters, and released on DVD with a 5.1 Dolby Digital soundtrack, so it’s rather puzzling that we only got a 2.0 stereo track for the Blu-ray. All things considered, Code 46 sounds appropriate. Dialogue is mixed effectively, never getting lost or muffled under the soundtrack, composed by The Free Association, or the sound effects. The film features a train motif, and frequently the sound generated by the trains effectively pans from right to left and vice versa, taking full advantage of the stereo separation. Code 46 sounds alright, but I can’t help but feel like we’ve missed out on a decent 5.1 surround sound track that’s out there somewhere. 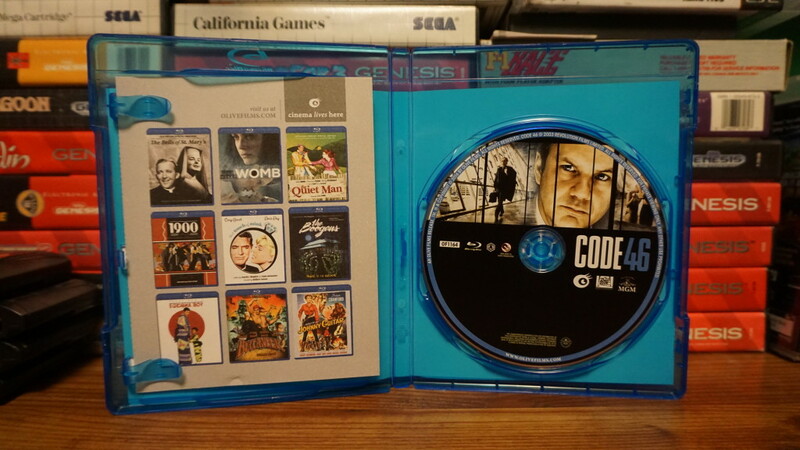 Code 46 is packaged in a standard blue keepcase. The case’s front artwork features the film’s theatrical poster art, which is appropriately dark and minimalist, keeping with the visuals of the film. The back artwork maintains the same style, but features a paragraph about the film, as well as production credits. There is a single line of technical info that is very easy to miss. Nothing too fancy here in terms of packaging. Theatrical Trailer – presented in 1.78:1, this trailer does an excellent job of hiding all of the film’s obvious flaws through quick cuts, and small bits of dialogue. It also looks to be presented in standard definition, so it looks kind of ugly. Code 46 wants to be an ambitious sci-fi neo-noir film, but doesn’t seem to have the patience to explain itself. Coupled with a pair of weak performances from our two leads, Code 46 just kind of falls flat from start to finish. I never felt particularly invested in the love story, or the world, and found it easy to lose interest in the film. Olive Films has presented the film on Blu-ray in the most barebones of ways, with a decent but imperfect video transfer, and a lackluster stereo audio transfer that lacks the atmospheric quality that a dark and noisy film like this deserves. With only a trailer on the disc, and packaging that simply recycles the theatrical artwork, it does little to inspire interest in the film. 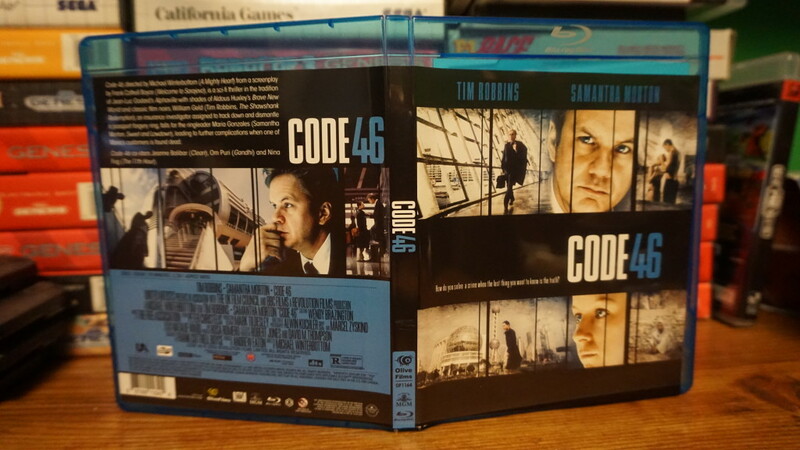 Unfortunately, it seems that Code 46 is effectively a swing and a miss on Blu-ray.